altenerG.com. 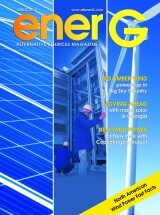 - enerG Alternative Sources Magazine - Your source for wind, solar, geothermal, tidal, wave, biofuels, utilities, biomass. 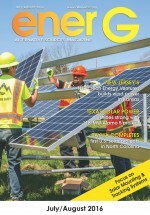 enerG magazine covers all areas of renewable energy including wind, solar, biomass, geothermal, and biofuels such as ethanol. New wind power for New York: EDF Renewables North America is now delivering additional wind power for New York state, with the completion of its 80 MW Copenhagen Wind Project in update New York, with Renewable Energy Systems, in charge of construction, and Copenhagen being the first wind project that RES has self-performed in the State of New York. Providing solar power—and educational opportunities--in Pennsylvania: Pennsylvania's Susquehanna University has opted for green power in a major way, with the university working with WGL Energy Systems on a new solar power project that is delivering clean, green power—and renewable educational opportunities-to the university. Moving ahead with major solar in Georgia: Renewable energy developer Invenergy is moving ahead with solar in a major way in Georgia, with the 160 MW Southern Oak Solar Park solar initiative, a project that features LONGi bifacial solar panels and NEXTracker's NX Horizon tracking system and its TrueCapture orientation control system. More wind power for Big Sky Country: Montana is in the top five of all 50 U.S. states for wind power potential, and BayWa tapped into part of that wind power potential in the Big Sky Country state in building a recent wind power project, the 25 MW Big Timber Wind Project, which is now generating power under the ownership ofConEdison Development. Ask the Experts: The question we ask of renewable energy experts in the Spring issue is: With the phase-out of the Production Tax Credit for wind power at the end of 2019, what can business and government do to ensure the steady development and construction of wind power projects in the U.S.?How will developments, like the commitment of big name companies like Apple and Google to wind power, help the transition? Wind Power Fast Facts: enerG's annual look at the top wind power projects and top wind power producing U.S. states and Canadian provinces. For the Record: Allison Archambault, President of EarthSpark International , talks about shaping a collective future with clean energy-and treehouses. Read all about exciting recent projects in enerG back issues! enerG is an exciting bimonthly magazine that delivers the big picture and bright future of the fastest growing industry-renewable energy-in North America. Its mission is to provide up-to-date information on renewable energy sources, and strategies on how to use our current resources to generate more environmentally friendly power. enerG is newsworthy and thought provoking. Regular features include profiles of renewable energy projects, and information on new products, services and technologies. enerG is a controlled circulation magazine, with a guaranteed reach of over 25,000 individuals and key decision-makers in the industry These decision-makers have direct influence and purchasing power on renewable energy projects, products and services. enerG is focused on the entire North American market. We are dedicated to meeting the editorial needs of our readers, and reaching a select target audience for our advertisers.